In my holiday-themed book craze mood, I decided to add The Santa Claus Man to my list of books to read this Christmas season, wanting something to break up the more sentimental and traditional fiction fare. It proved a good choice. Oh, to have lived and breathed in New York City in 1913, particularly around the holiday season! It must have been quite a year. David Duval Gluck, Jr., is not well known today, although at one time he was a household name. Once in the family business working in customs and brokerage, Gluck longed for something more. Like many, he wanted recognition and to do something worthwhile with his life. His early attempts were not quite successful, but he was as persistent as he as charismatic, and eventually his efforts paid off. Nineteen thirteen was a year of change. The United States Postal Service was about to have its busiest Christmas season ever adding parcel shipping to their list of duties. Their past efforts to find someone to play Santa Claus and answer all the letters that came in addressed to the famous Christmas icon had failed, but that year the young and ambitious David Duval Gluck, Jr. stepped up to the plate. The thought of the letters ending up in the Dead Letters section or destroyed was publicly abhorrent, after all. Gluck had the perfect plan designed to connect donors with the letters' recipients, keeping costs down and Christmas spirits high. He worked out a method to ensure no one took advantage of the service, giving to children and families in need being the priority. Gluck's plan worked well on all fronts, although it was not flawless. He formed the Santa Claus Association to give more credence to the cause. He and his volunteers were high from their success and the popularity of the program. It garnered attention far and wide, drawing in celebrities, the wealthy, and powerful figures. The program would bring happiness to children for years to come, bringing people together from all walks of life, all in the name of the Christmas spirit. Gluck's story is told alongside that of New York's City's growing pageantry of the holiday season, from the evolution of St. Nicholas to Santa Claus and how he is portrayed today. I found myself swept up in the excitement of the times as I read Alex Palmer's nonfiction account of events as they unfolded--the lighting of the Christmas tree in Madison Square Garden and the way it brought together the community--to the efforts to help the needy and poor, especially the children. Business in the City was booming and on the rise during those years. There was new construction, the restructuring of the market district, and small businessman were becoming big ones. Business and life seemed to be flourishing. Underneath that holiday cheer and well meaning, lay something darker, as it sometimes does when ambition and positive recognition get a taste of success. In Gluck's case, and that of others around him, it was no different. Especially when they realized just how much money could be made all in the name of charity. Charities, after all, were not well regulated at the time. A lot is said about the United States Boy Scout group, an adversary group to the Boy Scouts of America, a group well respected and still around today. The United States Boy Scout may have begun with pure intentions, but the management's practices were shifty and not above board. Gluck aligned himself with the United States Boy Scout early on in his career with the Santa Claus Association. And, well, you can imagine how that played out. Alex Palmer packs a lot into this book, which I found both fascinating and informative. While some of the broader historical facts I was aware of, there was much I hadn't known before. Gluck was well liked and loved by many, and no wonder. I could not help but be drawn to Gluck to some degree, even knowing how everything would turn out. He obviously made several bad choices, lied, manipulated, and stole from those less fortunate. And yet I don't think that was his original intention. Does it excuse his behavior? Of course not. 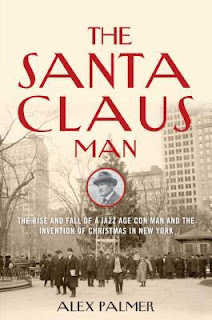 I am glad I added The Santa Claus Man to my reading list this season. I enjoyed the addition of the photos throughout, bringing the time period to the forefront even more so. There was a good balance between being an inspirational read while also being a cautionary tale. Whoever says real life isn't as interesting and entertaining as fiction should take a closer look at history. To learn more about Alex Palmer and his book, please visit the author's website. He can also be found on Goodreads, Twitter, and Facebook. I hope you will check out what others had to say about The Santa Claus Man on the TLC Book Tours route! Many thanks to the TLC Book Tours for the opportunity to be a part of this book tour. I purchased a copy of this book myself. Definitely one for the Christmas Spirit Reading Challenge, I so sound like the sound of this. Great review, thank you. I love narrative nonfiction and think this story sounds fascinating. I've never heard of Gluck but want to know his story after reading your review. Kathy - I found it to be quite interesting. I think you might enjoy this one, Kathy. This sounds fascinating! The whole idea of the Santa Claus Association and the growing craziness around Christmas sounds interesting and then add in all those very different groups and this is definitely a book I want to read. Katherine - It was such an interesting time period with so much going on--both good and bad. I enjoy books like this. I do recommend it! I enjoy finding out the background behind traditions--and this fits the bill. I'll be adding this book to my list for next year's holiday. Catherine - Me too. I love this kind of history! This sounds fascinating and right up my alley! Thank you for bringing it to my attention. Lark - If you do read it, I hope you like it. It was such an interesting look at that time period and then to compare it to today. I KNEW I should have picked this one up! This looks like a great book for me - history and holidays together! Heather - Yes, it was the perfect book to read around the holidays. I loved the historical details!